Montreal (AFP) - Unbeaten Billy Joe Saunders threw down the gauntlet to four-belt champion Gennady Golovkin with a systematic dismantling of David Lemieux in his North American professional boxing debut on Saturday. The 28-year-old Englishman kept his World Boxing Organization middleweight title by scoring a lopsided unanimous decision victory over Canadian crowd favorite Lemieux. Saunders holds the only world title in his weight class that is not in the hands of Golovkin. The Englishman is now eyeing a unification fight with the Kazakhstani fighter after racking up 25 straight victories before making his first appearance in North America on Saturday. "Now fight me. We will see a different story. You be punching fresh air," Saunders said of Golovkin. Golovkin is in talks for a rematch with Canelo Alvarez on May 5 and if the pieces fall together the way Saunders hopes, the Brit could challenge Golovkin or Alvarez in late 2018 or sooner. Golovkin holds the WBA, WBC, IBF and IBO middleweight titles. Saunders relied on his ring savvy and hand speed to bloody and disarm the explosive punching power of Lemieux, who had 33 knockouts in 38 victories heading into Saturday's contest at the Place Bell arena in Laval, Quebec. He won by scores of 120-108, 117-111 and 118-110. Saunders got the upper hand from the opening bell as he peppered the Canadian with jabs and combinations, winning every round on one judge's scorecard. "I knew what he (Lemieux) was coming for," Saunders said. "I look easy to whip. I look easy to put down. I look like I could run out of gas. But you can't hit me. I like to come into someone's backyard because I perform better." 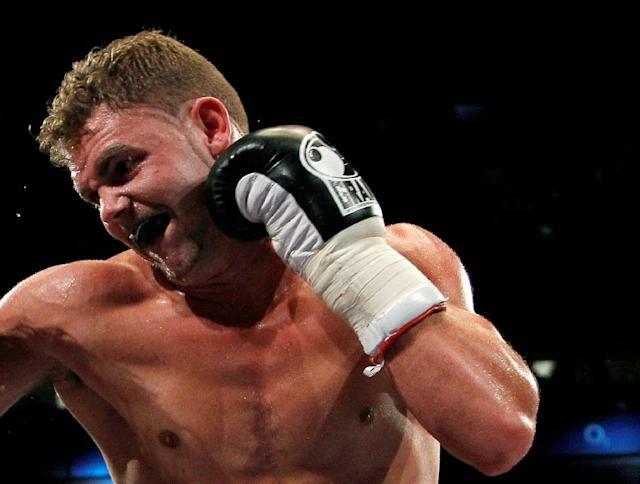 Saunders said he owes everything to his new coach Dominic Ingle. Without him, "my boxing career would be finished," he said. Saunders (26-0, 12 knockouts) made the third defense of the title he won by outpointing Ireland's Andy Lee two years ago. Lemieux's best round was the third but he failed to do any serious damage to Saunders, landing just 67 overall punches to 165 for the champion. Lemieux said his attack was blunted after he hurt his left hand in the second round. He also complained that Saunders did too much running away instead of fighting in the center of the ring. "It wasn't my best night. He was on the run from the first round to the end. I guess that is the strategy he needs to win a fight," Lemieux said. Lemieux had his four-fight win streak snapped, losing for the first time since Golovkin stopped him in the eighth round two years ago.